Ellington (hamstring) was released by the Lions on Friday, Tim Twentyman of the Lions' official site reports. Analysis: Ellington caught on with Detroit late in the 2018 season, catching 23 of 30 targets for 132 yards in four games before a hamstring injury sent him to injured reserve. He's proven to be a competent slot receiver on a few different occasions, but persistent hamstring issues have kept him off the field for most of his pro career. Regardless of where he ends up, Ellington figures to enter training camp on the roster bubble. Ellington (hamstring) can become an unrestricted free agent in March, Dave Birkett of the Detroit Free Press reports. Ellington (hamstring) was placed on injured reserve Saturday. Ellington (hamstring) has been ruled out for Sunday's game against the Vikings. Ellington (hamstring) was limited in Thursday's practice. Analysis: Ellington spent time on the Texans' injured reserve list earlier this season due to the hamstring and sat out the Week 15 loss to the Bills with the same injury, so it wouldn't be surprising if the Lions restricted his practice reps the rest of the way. That leaves the slot wideout's status uncertain for Sunday's game against the Vikings, potentially creating an opening for Andy Jones to see an elevated role on offense for another week. Ellington (hamstring) was a limited participant at Wednesday's practice. Analysis: Ellington took a step forward after failing to practice in any capacity last week, but it's still hard to have confidence once his history of hamstring injuries is taken into account. The 27-year-old slot receiver at least seems to have some shot at returning for Sunday's game against the Vikings after sitting out the Week 15 loss to the Bills. Ellington (hamstring) took part in practice Wednesday, Tim Twentyman of the Lions' official site reports. Analysis: It isn't clear how involved Ellington was in the session, but this is nonetheless a step in the right direction after the receiver missed last week's loss to Buffalo with the hamstring injury. Ellington's potential return to the field in Week 16 against the Vikings would likely result in a decrease in playing time for Andy Jones. Ellington (hamstring) has been ruled out for Sunday's game at Buffalo, Dave Birkett of the Detroit Free Press reports. Analysis: Ellington's medical history is checkered with hamstring injuries, so the Lions seem to be opting for a cautious approach with the journeyman wide receiver. In Ellington's absence, expect Kelly Golladay to act as Matthew Stafford's (back) No. 1 wide receiver, with TJ Jones, Andy Jones and Brandon Powell rounding out the corps. Ellington (hamstring) isn't practicing Friday, Tim Twentyman of the Lions' official site reports. Analysis: Given his history of hamstring injuries and continued absence from practice, Ellington seems like a long shot to play in Sunday's game at Buffalo. The Lions will turn to some combination of TJ Jones, Andy Jones and Brandon Powell behind top target Kenny Golladay. Ellington (hamstring) isn't participating in Thursday's practice, Dave Birkett of the Detroit Free Press reports. Analysis: Ellington's back-to-back absences from the Lions' first two practices of Week 15 imply that the hamstring injury he's tending to is more significant than the back issue that had merely rendered him a limited participant for the past three weeks. He'll probably need to fit in some work Friday to have a realistic shot at filling his usual role as Detroit's top slot man in Sunday's game against the Bills. Ellington (hamstring) didn't practice Wednesday, Tim Twentyman of the Lions' official site reports. Analysis: Bothered by a minor back issue the past few weeks, Ellington injured his hamstring during Sunday's 17-3 win over the Cardinals. Given his lengthy history of hamstring problems, the 27-year-old slot receiver doesn't seem especially likely to suit up for Sunday's game in Buffalo. An absence would free up more snaps for TJ Jones and Andy Jones, with Brandon Powell potentially also joining the mix. Ellington (hamstring) was ruled out of Sunday's contest in Arizona, Justin Rogers of The Detroit News reports. Analysis: After catching all four of his looks for 17 yards, Ellington boasts 23 catches (on 30 targets) for 132 yards in four games with the Lions. However, his upcoming practice reps likely will be impacted by the hamstring injury that knocked him out Sunday. With Ellington sidelined, the Lions are down to three active wide receivers (Kenny Golladay, TJ Jones and Andy Jones) and one inactive (Brandon Powell, with a calf injury). Ellington is questionable to return to Sunday's contest at Arizona due to a hamstring injury, Michael Rothstein of ESPN.com reports. Analysis: Prior to his departure in the third quarter, Ellington gathered all four of his targets for 17 yards. If he remains sidelined, the Lions will be down to three active wideouts (Kenny Golladay, TJ Jones and Andy Jones). Ellington (back) is active for Sunday's game in Arizona, Kyle Meinke of MLive.com reports. Analysis: Ellington's practice reps have been capped at limited participation for three weeks at this point, but the journeyman wide receiver will be available to Matthew Stafford (back) for a fourth consecutive contest as a Lion. Targets won't be difficult to come by opposite Kenny Golladay with Marvin Jones (knee) on IR and rookie running back Kerryon Johnson (knee) sidelined again. In the prior three games, Ellington gathered in 19 of his 26 targets for 115 yards. Ellington (back) was a limited participant in Friday's practice and is listed as questionable for Sunday's game against the Cardinals. Analysis: For the third straight week, Ellington failed to advance beyond limited participation in practice, but his status for gameday doesn't look to be in any real jeopardy. While carrying questionable designations into the prior two contests, Ellington ultimately suited up and enjoyed full snap counts on both occasions, picking up 13 receptions for 63 yards along the way. Another PPR-friendly role in the Detroit passing attack awaits him Sunday. Ellington (back) was a limited participant at Thursday's practice. Ellington (back) was a limited practice participant Wednesday, Dave Birkett of the Detroit Free Press reports. Analysis: Ellington has been playing through the same injury for a few weeks, catching 19 of 26 targets for 115 yards in three games with the Lions. He should handle a regular workload Sunday in Arizona, as quarterback Matthew Stafford (back) still lacks receiving options beyond Ellington, Kenny Golladay and Theo Riddick. Ellington brought in seven of 10 targets for 35 yards during Sunday's 30-16 loss to the Rams. Analysis: Ellington has quickly become a favorite of quarterback Matthew Stafford, garnering 26 targets over his last three games as the Lions look to replace the injured Marvin Jones (knee). However, Ellington's almost exclusively seeing his passes come on short, underneath routes, and the fifth-year pro hasn't been able to rack up many yards after the catch. This sort of role makes Ellington hard to trust outside of PPR formats. Ellington (back) is active for Sunday's game against the Rams. Ellington (back) is listed as questionable for Sunday's game against the Rams, Tim Twentyman of the Lions' official site reports. Analysis: Ellington played through the same injury last week against Chicago, catching six of seven targets for 28 yards. His ability to log limited practices throughout the week suggests he should be able to suit up for Sunday's matchup with a Rams defense that will return Aqib Talib (ankle) to its secondary this weekend. Ellington (back) was a limited participant in Thursday's practice. Analysis: Though Ellington's practice reps were capped for the second straight day, no reports have surfaced yet suggesting the wideout is at serious risk of missing Sunday's game against the Rams. Still, those planning on using Ellington in Week 13 lineups would surely be emboldened by the 27-year-old practicing fully in Friday's session. Ellington has notched six receptions in both of his first two games with Detroit, though he's averaged a lowly 5.0 yards per target in those contests. Ellington (back) was a limited practice participant Wednesday, Kyle Meinke of MLive.com reports. Ellington could handle a significant role on offense for the rest of the season after the Lions placed fellow wide receiver Marvin Jones (knee) on injured reserve Monday, Michael Rothstein of ESPN reports. Ellington (back) brought in six of seven passes for 28 yards in the Lions' 23-16 loss to the Bears on Thursday. Analysis: Ellington couldn't get much going downfield, but he impressively played through back discomfort to post his second six-catch effort in as many games in a Lions uniform. The veteran is proving to be a valuable complementary option for Matthew Stafford in the absence of Marvin Jones (knee), a role he'll look to continue thriving in against the Rams in a Week 13 battle on Dec. 2. Ellington (back) is listed as active Thursday against the Bears, Tim Twentyman of the Lions' official site reports. Analysis: Limited by a back injury during the week, Ellington is set for his second appearance as a member of the Lions. With fellow wideout Marvin Jones and standout rookie running back Kerryon Johnson sidelined by knee issues, Ellington will look to replicate his six-catch, 52-yard performance on nine targets from his first game as a Lion this past Sunday at Carolina. Ellington (back) is listed as questionable for Thursday's game against the Bears, Tim Twentyman of the Lions' official site reports. Analysis: Ellington was listed as a limited participant throughout the week after catching six of nine targets for 52 yards in Sunday's 20-19 win over the Panthers. He could be in for another sizable workload if he suits up, as the Lions won't have Marvin Jones (knee) or Kerryon Johnson (knee) in the lineup. Ellington (back) was a limited practice participant Tuesday, Dave Birkett of the Detroit Free Press reports. Analysis: Ellington apparently suffered the injury in Sunday's win over the Panthers and has been limited at both practices this week. Unless the 27-year-old is able to put in full practice session Wednesday, he seems likely to wear the questionable tag for Thursday's game against the Bears on a short week of preparation. Ellington (back) was a limited participant in Monday's practice, Scott Bordow of The Athletic reports. Analysis: There was no mention of Ellington getting injured during Sunday's victory over Carolina, but fantasy owners nonetheless need to keep an eye on the receiver's status as the Lions prepare on a short week for Thursday's matchup against the Bears. Ellington brought in six of nine targets for 52 yards in the Lions' 20-19 win over the Panthers on Sunday. Analysis: Ellington was solid in a complementary role alongside lead wideout Kenny Golladay with Marvin Jones (knee) sidelined. The five-year veteran was making his Lions debut after opening the season with the Texans, and the initial returns were certainly encouraging, especially for a Detroit team that could be without Jones for an extended period. Ellington will have a short turnaround before likely serving in a prominent role once again versus the Bears in a Thanksgiving Day showdown. Ellington could see a significant workload Sunday against the Panthers with teammate Marvin Jones (knee) sidelined, Michael Rothstein of ESPN.com reports. Ellington (coach's decision) was inactive for Sunday's 34-22 loss to Chicago. Analysis: Signed just days before kickoff, Ellington understandably needs more time to learn the playbook before the Detroit coaching staff can feel comfortable giving the receiver live game reps. Ellington's next chance to make his Lions debut will come next Sunday in a Week 11 home game against the Panthers. Ellington agreed to a contract with the Lions on Tuesday, Ian Rapoport of NFL Network reports. Ellington recently went through a workout with the Lions, Adam Caplan of SiriusXM Radio reports. Analysis: Ellington seems healthy after being waived from the Texans' injured reserve in late October. While there's no word on whether Detroit extended him a contract offer, the fifth-year pro could be a nice fit on a Lions team that would benefit from an upgrade at slot receiver after trading Golden Tate to the Eagles last week. The Texans waived Ellington (hamstring) off injured reserve Wednesday, Ian Rapoport of NFL Network reports. 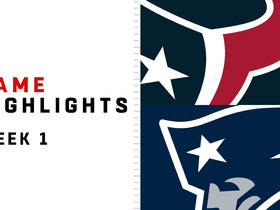 The Texans placed Ellington (hamstring) on injured reserve Tuesday, Deepi Sidhu of the team's official site reports. Ellington did not return from a hamstring injury suffered during the first quarter of the Week 3 loss to the Giants, Aaron Wilson of the Houston Chronicle reports. Analysis: Ellington suffered the injury on the fourth play of Houston's first drive. He was replaced by Vyncint Smith and is expected to wear the questionable tag heading into Week 4 at Indianapolis. Ellington departed Sunday's game against the Giants with a hamstring injury and is questionable to return. Analysis: Ellington went down with the injury after hauling in a 10-yard reception on the Texans' opening drive. Houston only has four active receivers for the contest, so if Ellington is unable to return, rookie Vyncint Smith could be pressed into a significant role behind starters DeAndre Hopkins and Will Fuller. Ellington caught all three targets for 45 yards in Sunday's 20-17 loss to the Titans in Week 2. Analysis: Ellington was targeted eight times Week 1, but as expected he had a lower profile Week 2 with the return of Will Fuller from a hamstring injury. He was dropped to third on the depth chart and in the pecking order for targets. The Texans threw the ball 32 times with 20 of those directed at top wideouts DeAndre Hopkins (11 targets) and Fuller (nine). Ellington caught four of eight passes for 37 yards and a touchdown during Sunday's 27-20 loss to New England. Analysis: Ellington finally gave Houston its first touchdown of the game during the final moments of the contest, cutting across the middle for a five-yard touchdown. Ellington came on late last season and had a nice outing in Week 2 of the preseason. Any judgment about how he'll play this season needs to wait, however, until Will Fuller (hamstring) takes the field. Ellington figures to see an expanded role in Week 1, with Will Fuller (hamstring) and Keke Coutee (hamstring) both inactive for Sunday's game against the Patriots, the Houston Chronicle reports. Analysis: DeAndre Hopkins is obviously the Texans' top wideout option in Week 1, but for those scrambling for wideout help Sunday for whatever reason, Ellington is worth looking into. Ellington is listed as the starting third receiver for Week 1 against the Patriots. 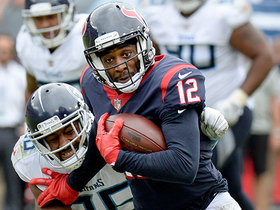 Analysis: The Texans are expected to use a lot of three wide receiver sets, and Ellington gets the first crack in the slot ahead of rookie Keke Coutee, who did not see action during the preseason. The organization invested a fourth-round draft pick in Coutee and loves his speed, so Ellington may be challenged for the top slot spot in the coming weeks after Coutee gets some game action under his belt. Ellington caught four of six targets for 50 yards and a touchdown in Saturday's preseason game against the 49ers. Ellington brought in three of four targets for 22 yards in the Texans' 17-10 preseason win over the Chiefs on Thursday. 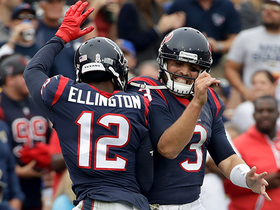 Ellington has been effective from the slot during the opening days of training camp, John Harris of the Texans' official site reports. Analysis: It's good to hear that Ellington is fully involved in team drills considering the receiver finished last season on injured reserve with a hamstring injury. Entering his fifth year in the league, the South Carolina product seems to have the inside track to the starting slot role in between DeAndre Hopkins and Will Fuller. However, Ellington will need to fend off fourth-round rookie Keke Coutee as well as the underperforming Braxton Miller in order to secure that No. 3 spot on the depth chart. 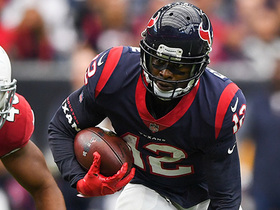 Ellington (hamstring) signed a one-year, $1.25 million contract with the Texans, receiving $200,000 guaranteed in the form of a signing bonus, Aaron Wilson of The Houston Chronicle reports. Ellington (hamstring) signed a one-year contract extension with the Texans on Wednesday, John McClain of the Houston Chronicle reports. Analysis: Ellington signed with the Texans during training camp of 2017 and totaled 330 yards with two touchdowns on 29 receptions before landing on injured reserve after 11 games due to a hamstring injury. 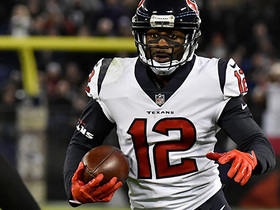 While it isn't clear where he stands in his recovery, Ellington should be back to full health in time for training camp, when he'll square off with Braxton Miller and a draft pick or two for slotting on the depth chart under DeAndre Hopkins and Will Fuller. Ellington (hamstring) finished the 2017 season with 29 receptions and 330 receiving yards in 11 games for the Texans. Analysis: Ellington sustained the hamstring injury against the Titans in Week 13 and landed on injured reserve shortly thereafter, but still finished third on the team in receptions. The 26-year-old enters 2018 as a restricted free agent, and the Texans' plans at wide receiver don't appear solidified behind top options DeAndre Hopkins and Will Fuller. Ellington (hamstring) has been placed on injured reserve by the Texans. Analysis: With Ellington on IR, wideout DeAndrew White was added to the Texans' active roster. The loss of Ellington for the team's stretch run taxes the team's wideout depth behind top wideout DeAndre Hopkins. Braxton Miller (concussion), Chris Thompson and versatile running back Andre Ellington remain on hand, but ideally, from the Texans' perspective, Will Fuller (ribs) will be able to return sooner rather than later. Ellington (hamstring) did not return to Sunday's game against the Titans, Terry McCormick of TitanInsider.com reports. Analysis: Ellington was designated questionable to return Sunday before ultimately being ruled out. The 26-year-old had five receptions for 56 yards prior to hurting his hamstring, and Braxton Miller has been the immediate beneficiary of his absence. There is no indication as to the severity of the injury at this point. Ellington is questionable to return to Sunday's game against the Titans with a hamstring injury, Sarah Barshop of ESPN.com reports. Analysis: Ellington was nursing a knee injury in practice this week but avoided an injury designation, and he was serving as the Texans' No. 2 receiver with Will Fuller (ribs) inactive Sunday. Braxton Miller and Chris Thompson are the only remaining available wideouts for Houston should Ellington be unable to return. Ellington was limited due to a knee injury during Friday's practice, but doesn't carry a designation heading into Sunday's game against the Titans. 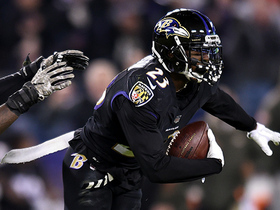 Ellington caught three of eight targets for 29 yards in Monday's 23-16 loss to the Ravens. Analysis: The production wasn't there Monday, but Ellington remains heavily involved in the passing attack. He's averaged 7.8 targets over the last four games with Tom Savage at quarterback. His playing time will drop if Will Fuller (cracked ribs) ever gets back to being game-ready, but it's conceivable the 4-7 Texans, barely breathing for a postseason berth, shut down an asset like Fuller. Week 13 has Houston on the road in Tennessee, whose defense ranks 20th defending the pass (234.3 YPG). Ellington will start for a second consecutive game Monday night against the Ravens, Aaron Wilson of the Houston Chronicle reports. Analysis: Will Fuller (cracked ribs) has been declared out for Week 12, granting Ellington another start. The 25-year-old wideout has thrived since Fuller injured his ribs Week 10. Ellington has been targeted 15 times, catching 10 for 104 yards, over the past two games. Ellington caught six of seven targets for 63 yards and added a five-yard run during Sunday's 31-21 win over Arizona. He fumbled during the contest. 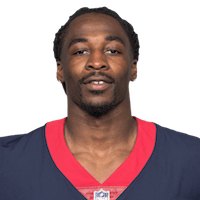 Ellington will start in place of the injured Will Fuller (ribs) in Week 11 against the Cardinals, Aaron Wilson of the Houston Chronicle reports. Analysis: Ellington filled in nicely early in the season when Fuller missed time due to a collarbone injury, but had seen his role diminished once Fuller returned. Now, with Fuller sidelined at least one week, the 26-year-old Ellington has an opportunity to regain some of that lost value. He enters Sunday's game having been targeted 16 times, including three in the red zone, since Tom Savage took over for the injured Deshaun Watson (knee) two games ago. With Will Fuller (ribs) expected to miss at least one game, Texans coach Bill O'Brien said the team needs to get Ellington more looks, Aaron Wilson of the Houston Chronicle reports. Ellington caught four of eight targets for 41 yards, including a 26-yard touchdown in Sunday's 33-7 loss to the Rams. Analysis: Ellington's touchdown came on the very next play after Will Fuller departed the game and never returned with a rib injury. Fuller's injury opens the door for a larger role for Ellington, who's had 16 targets over the last two weeks since Tom Savage took over as the starting quarterback. We'll learn more about Fuller's injury after he undergoes X-rays on Monday. Ellington caught three of eight targets for 22 yards in Sunday's 20-14 loss to the Colts. 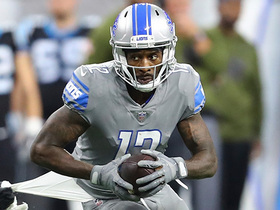 Detroit Lions wide receiver Bruce Ellington catches a short pass and makes multiple defenders miss on a 21-yard catch. Houston Texans wide receiver Bruce Ellington catches a deep pass from quarterback Deshaun Watson for a 23-yard gain. 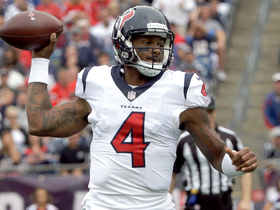 Houston Texans quarterback Deshaun Watson gets the ball between two defenders and Bruce Ellington catches it for a 5-yard touchdown. 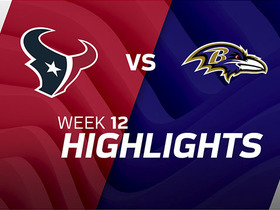 The Houston Texans take on the Baltimore Ravens in Week 12 of NFL action. Play-action fools Ravens' defense, Houston Texans quarterback Tom Savage hits wide receiver Bruce Ellington for 29 yards. 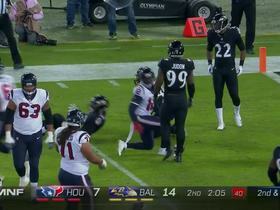 Houston Texans quarterback Ton Savage play fake completely fools Ravens defensive end. Baltimore Ravens safety Tony Jefferson intercepts Houston Texans quarterback Tom Savage while colliding with teammate. Houston Texans quarterback Tom Savage throws to wide receiver Bruce Ellington who rushes for 25-yard gain. Houston Texans quarterback Tom Savage connects with wide receiver Bruce Ellington for a 26-yard touchdown.